Saturday morning, October 18, promised a few raindrops and overcast skies. The weather, perfect for riding, was in the high 50’s. Pepper whinnied to her pasture buddies as I brushed her down and saddled up. I pulled on a rain poncho, just in case the sky decided to shower the earth. Stepping into the stirrup, Pepper and I headed up Murray Creek Road; on our way to meet up with Anne Shaffer and the riders from Rockin’ N Stables. The morning landscape unfolded before me; dull grey, splashed with muted orange and red. Quiet engulfed the countryside except for an occasional rustle as mice or a squirrel hurried through fallen leaves. I reined Pepper onto Reagan Road and saw the trail riders coming my way. I joined the group and we traveled along graveled back roads towards Round Top Park. It had been a long time since Anne and I had ridden together. Once in the park, we headed down a trail off the road only to spot a hunter stalking small game. The road seemed safer so we doubled back to the one road which cut through the park. At a scenic lookout the group dismounted, had a pleasant lunch, chatted and enjoyed the view of the valley far below. 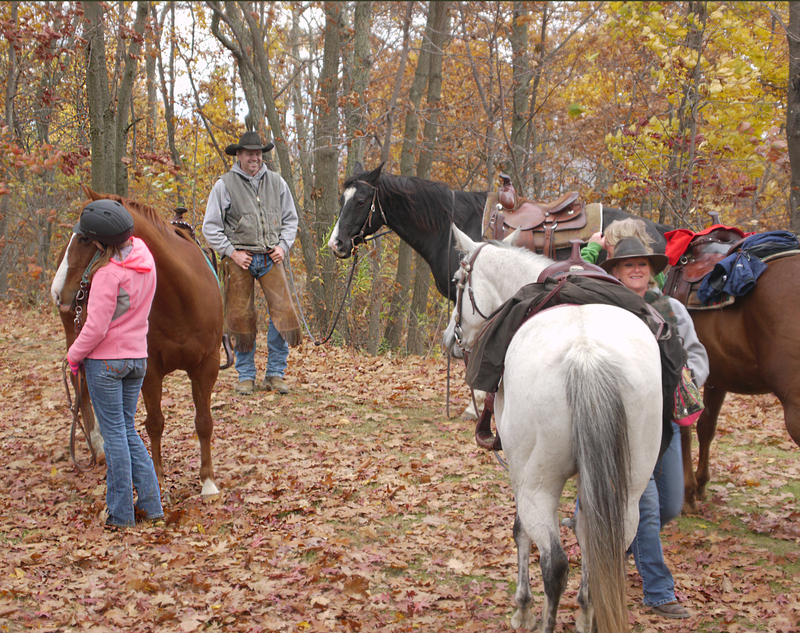 On the trail ride, I met Monte and Nancy the new owners at Rockin’ N Stables. The place was undergoing big changes, not only in name, but with new programs, riding lessons, boarding and plans for the future. A few days after the trail ride, I found myself sitting in at their kitchen table talking horses. Monte was born and raised in Honeyville, Utah; a small farming community in northern Utah not far from the Idaho border and skirted by the Wellsville Mountains to the east. He grew up on five acres of land. Horses were always part of Monte’s life; first his parents horses than his own. His grandparents managed a ranch which gave Monte a chance to experience ranch life. He watched as a young boy as his father trained horses. A tragic horse accident claimed his father’s life when Monte was 8 years old but that didn’t stop him from getting his first horse; a 3 month old Quarter Horse/Thoroughbred mix. In high school, he signed up for rodeo classes. The classes stressed roping and teamwork. The Box Elder County Sheriff’s Posse worked with the students when they practiced roping skills at the local fairgrounds. Monte participated in rodeos through high school and joined the Box Elder County Sheriff’s Posse for a few years after graduation. He improved his knowledge of horses by attending clinics and gained experience by training horses. Monte developed as a trainer and now trains horses at Rockin’ N.
Although Nancy’s dad owned Arabs and ran a tack shop, her family moved a lot due to the nature of her father’s job. So she never had her own horse as a child. When she reached her early 30’s Nancy bought her first horse from a horse dealer. Cash, a Paint Quarter horse, proved an emotional wreak; she later found out the horse had been beaten with a 2-by-4. The dealer upon delivering the horse gave her a parting word of advice, “ride that horse as much as you can. The more you ride him the better he’ll be.” And that’s just what she did. 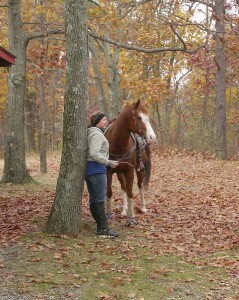 With patience, understanding, work and love Cash turned the corner from a difficult horse to a true companion. Monte and Nancy bought Round Top Stables last year and renamed the place Rockin’ N Stables. 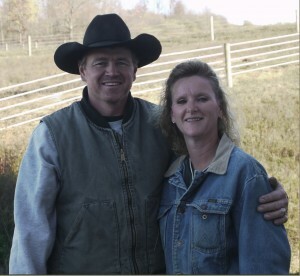 As newlyweds, they are building and planning their dream of managing a horse business. Monte trains horses and Nancy gives riding lessons to people of all ages. Their mentor, John Mallory, an expert horseman gives private lessons once a month as well as providing advice to the couple. Lady’s night is every other Thursday from 6 to 8 pm. Every other Wednesday the arena is available to work your horse. 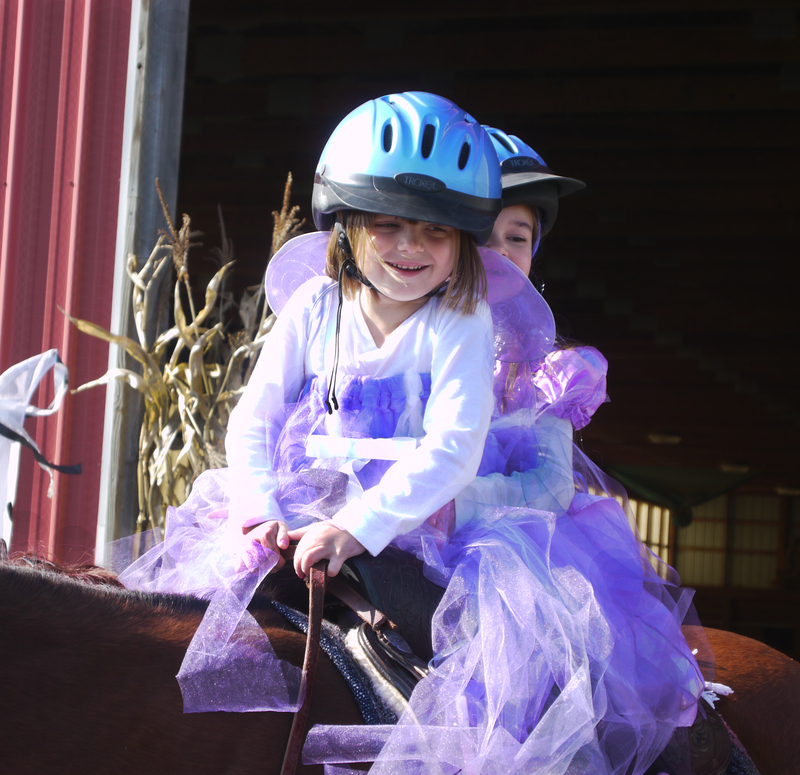 Play dates are scheduled for social time and working horses on barrels and poles. 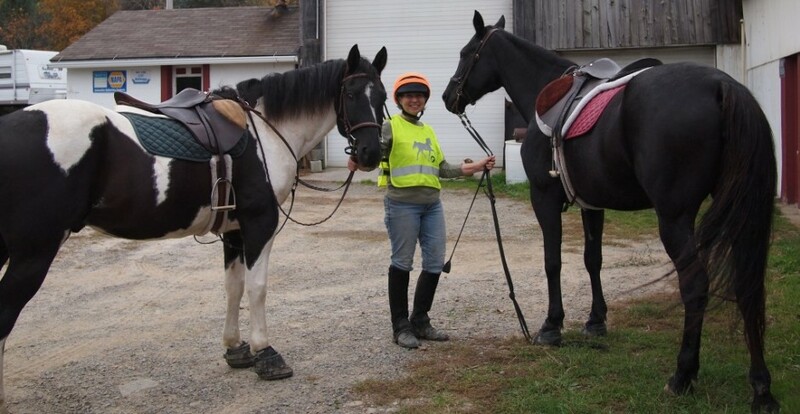 In December or January there will be a Trail Challenge clinic to desensitize horses to spooky things on the trail and road such as mailboxes and bridges. 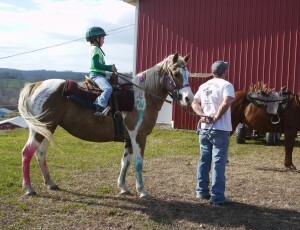 Every year, the stables will host an annual trail ride. Additionally, Monty and Nancy will sponsor a reception to thank people who have participated in events at Rockin’ N. The ranch has 40 stalls to stable horses. For a schedule of events follow Rockin’ N on facebook or call (570) 250-1038 to visit the stables at 3323 Wolcott Hollow Road, Athens, PA.
A few days later, I attended Rockin’ N’s Halloween Party/Play Day. 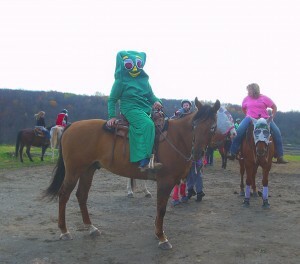 There were participants of all ages in costume, running barrels, playing horse games, hanging out and just having a good time. This entry was posted in Uncategorized and tagged Athens, Box Elder County Sheriff's Posse, operating horse business, PA, Rockin' N Stables and Ranch, trail riding. Bookmark the permalink. Nancy and Monte are two amazing people. So glad they settled in our community to offer their expertise. Not to mention a wonderful facility. I agree, our community is very lucky to have them.